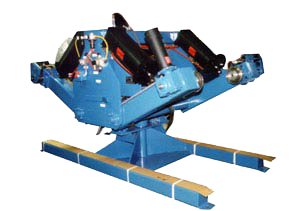 Coil payoff used to supply an extrusion line with a material prior to roll forming. 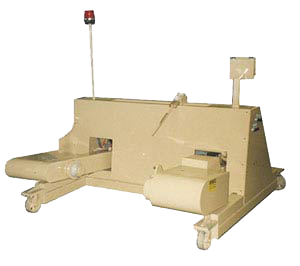 Double sided winder used to wind an extruded product on a corrugated spool. Multiple profiles were wound at the same time. Double payoff for large spools of fabric. Double payoff for large spools of material. 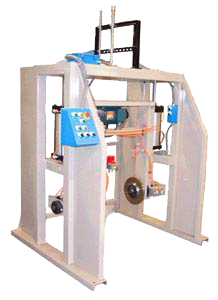 The unit features a spool lift and clamp that is powered to unwind the spool and deliver the material on demand to the process. While one side is delivering the other side can be loaded and waiting for the operating side to empty. Once empty the payoff can be rotated 180 degrees providing the new spool of material to the process. 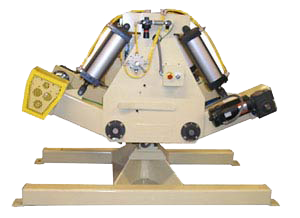 This system was a payoff for delivering small spools of material to an extruding process. The pinch wheel pulling devices were dancer controlled. Payoff for large spools of material. 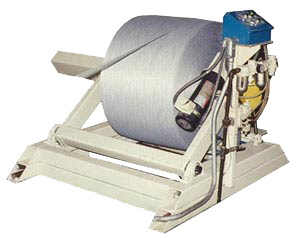 Spool is raised and powered to unwind the material. 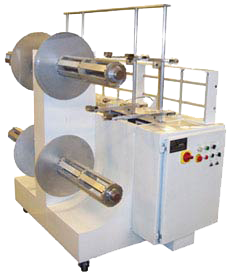 Large spool winder for an extruded product. Double payoff with independently controlled power heads. Spools of material can be lifted, paid off and the other side loaded and ready to go when the running side empties. Unit rotates 180 for paying off new material and loading the emptied side. Large payoff for handling a variety of spooled materials. Spooled material is lifted a paid off. 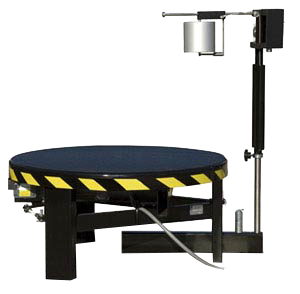 A precision drive controls the speed of the spool.